Robotic arms are here now! 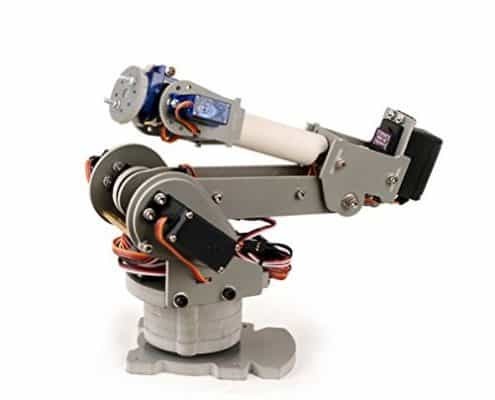 You can buy your robotic arm in parts and build your kit by yourself. These modern tools offer multiple functionalities when combined with intelligent phone apps or wired controllers. 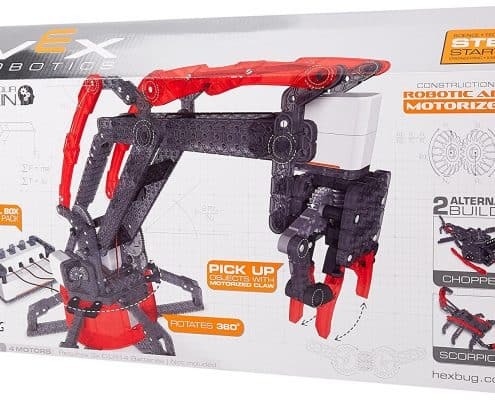 If you are looking for the best gift for teens or kids with a passion for building and assembling things, then buying them a robotic arm will be an excellent option. They are also great teaching tools for use in basic lessons on programming, robotics, and general automation. 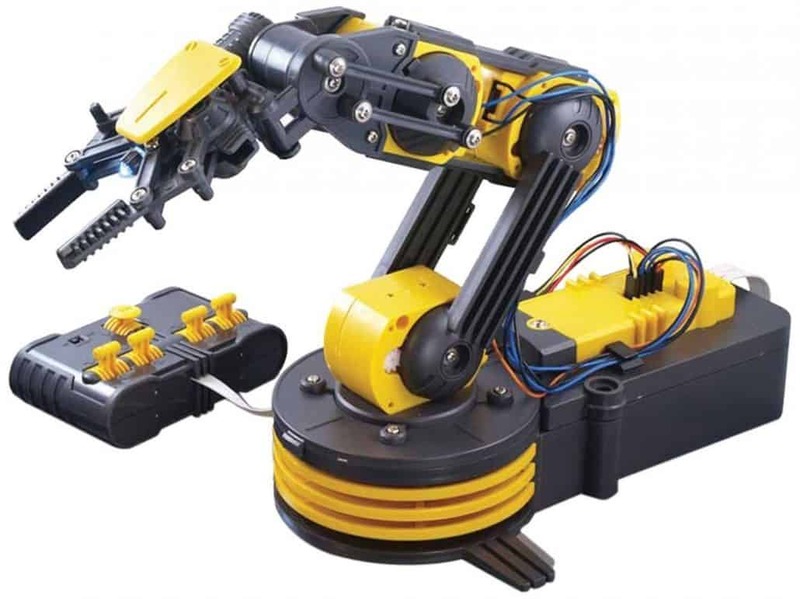 If you are in the market shopping for the best robot arm kits, then we are here to help you. We have reviewed the best in the market, both fully assembled models and buildable kits, to help you make an enlightened decision. 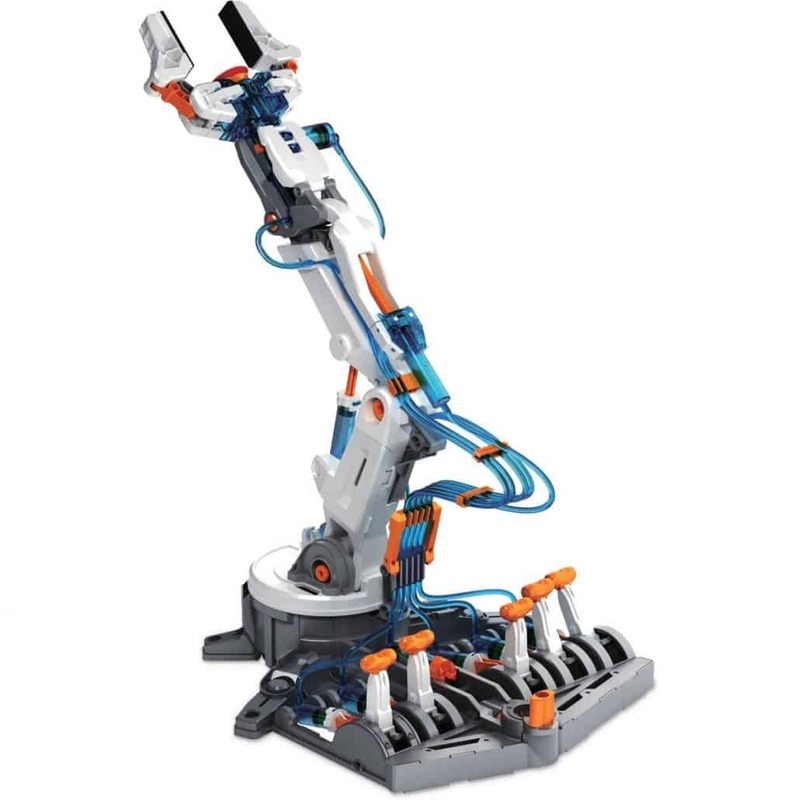 So what are the best Entry Level Robotic Arm this 2019 you ask? Robot arms will appeal both to adults and children. There’s a bunch of choices to choose from, ranging from simple arms to complex robotic arms. 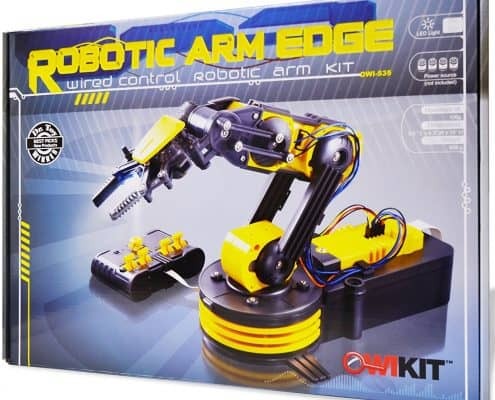 If you notice your child has high interest in robotics, you can buy them one of the below entry-level robotic arms. This can easily build his/her passion for this field and even influence their career choices. 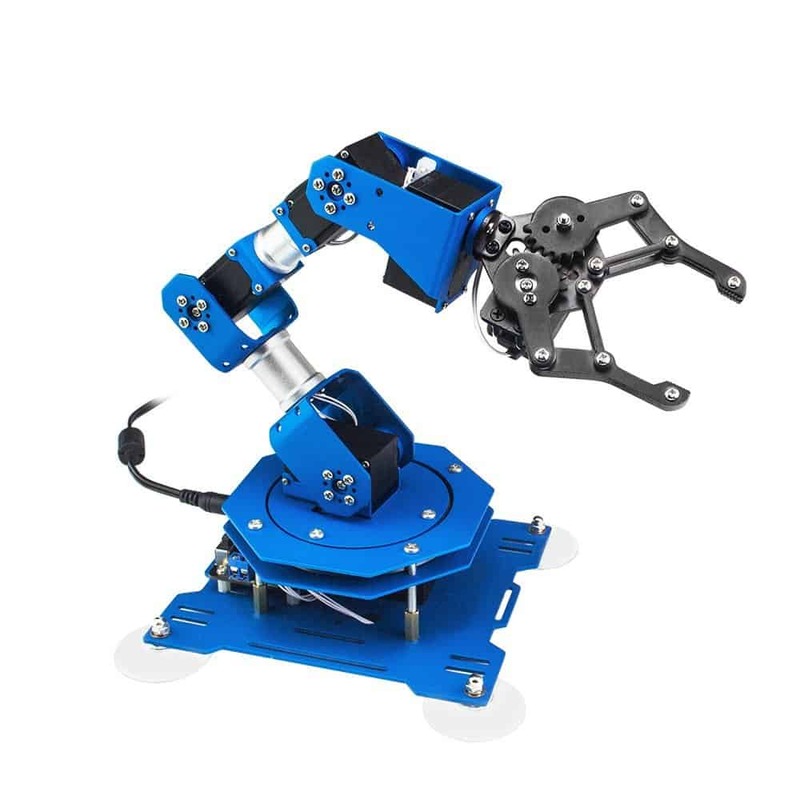 With the durable and advanced robot arms available, you will use the arm comfortably without fear of it falling apart or breaking down. To choose a suitable robotic arm for your needs, there are several things you need to put into consideration, we go through the most important ones below.. 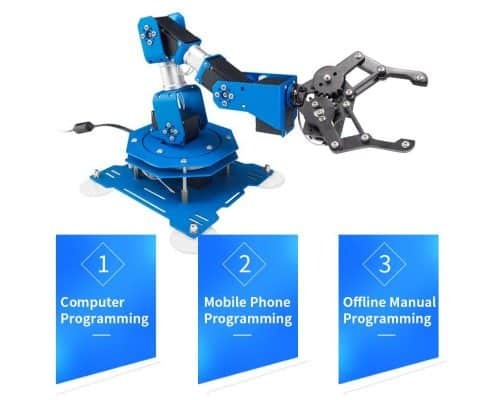 The first thing you need consider is the applications that will be performed by the robot arm. This will guide you when choosing the type of arm you need to buy. 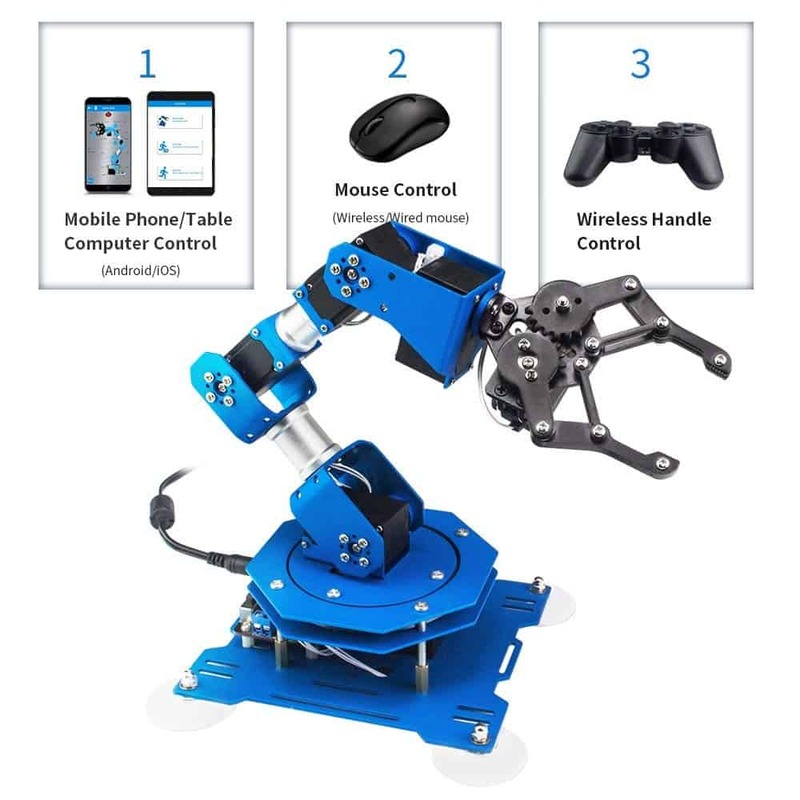 Are you looking for an arm that helps place small objects from one place to another at a fast rate or are you looking for a solid pick and place robot arm? 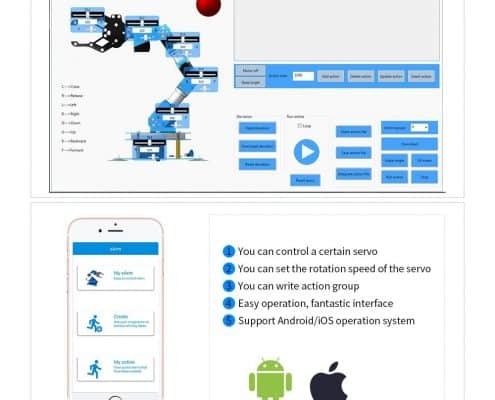 Knowing the work you intend your robot to perform will act as a guide to choosing the best robotic arm for your needs. The number of axes on a robot directly relates to its degrees of freedom. 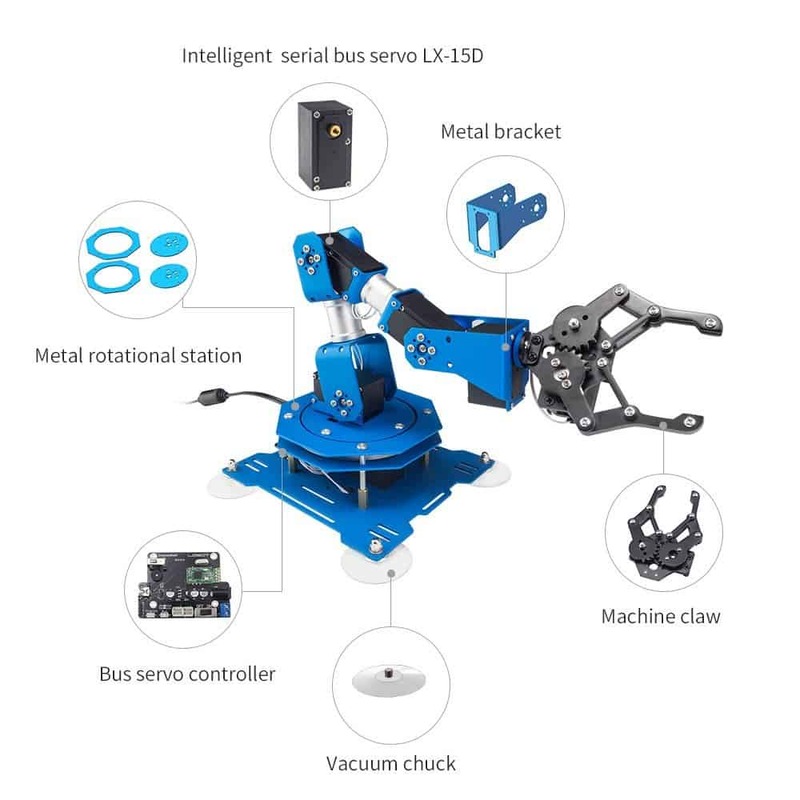 If you are looking for a solid pick and place robot, then a simple 4-axis arm will be enough. However, if your application needs to be carried out in a limited workspace, and robot needs to make many twists and turns, a 6-axis robot arm would be the best option for you. Payload is the maximum load a robot can carry when it is working. 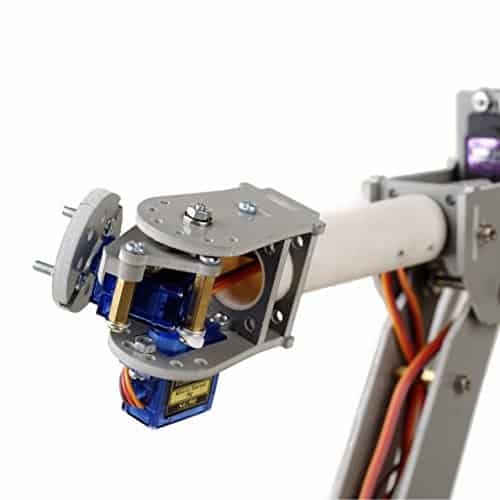 If you are looking to carry items from one place to another, you will need to incorporate robot arm gripper weight and items weight into the payload. 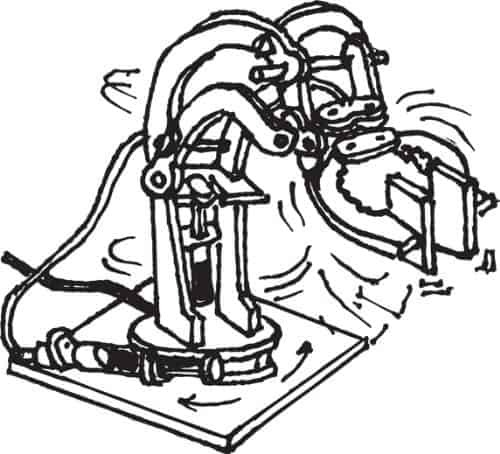 Repeatability can be explained as the capacity of the robot arm to reach the exact position each time it completes a routine. Most the robot arms have a repeatability range of 0.5mm; some can even have more. For instance, if your robot is needed to take parts from one machine to another, you may want a precise, repeatable robot. 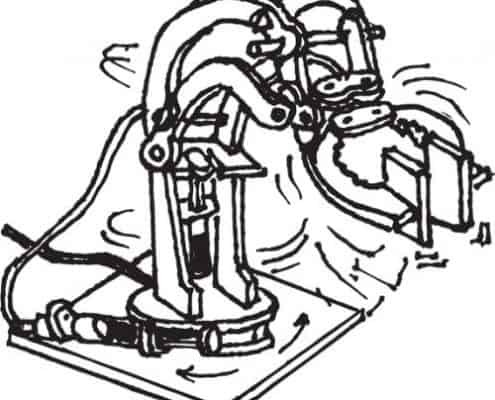 If your applications vary, the robotic arm you choose does not need to be very precise. This measure is denoted by a plus or minus value. 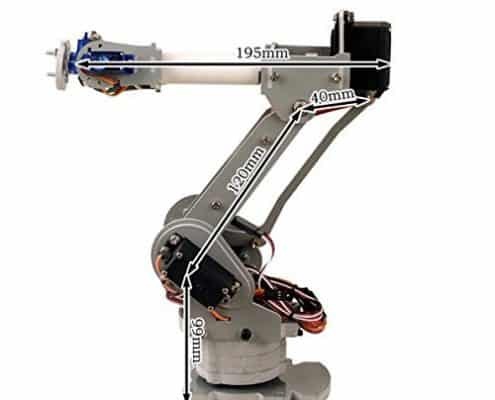 When looking at your intended application, you need to know the maximum distance your robot arm needs to reach. Payload and repeatability are not the only factors to consider the most- distance too is an important consideration. You will find this information listed in the product specifics. This will help you know if a robot is suitable for a specific application or not. The maximum vertical reach a robot arm can hit is measured from the lowest point it can reach to the maximum height its wrist can go. The horizontal reach refers to the distance from the center point of the robot base to the farthest distance the arm can extend horizontally. You also need to take a look at various motion ranges that are normally expressed in degrees. 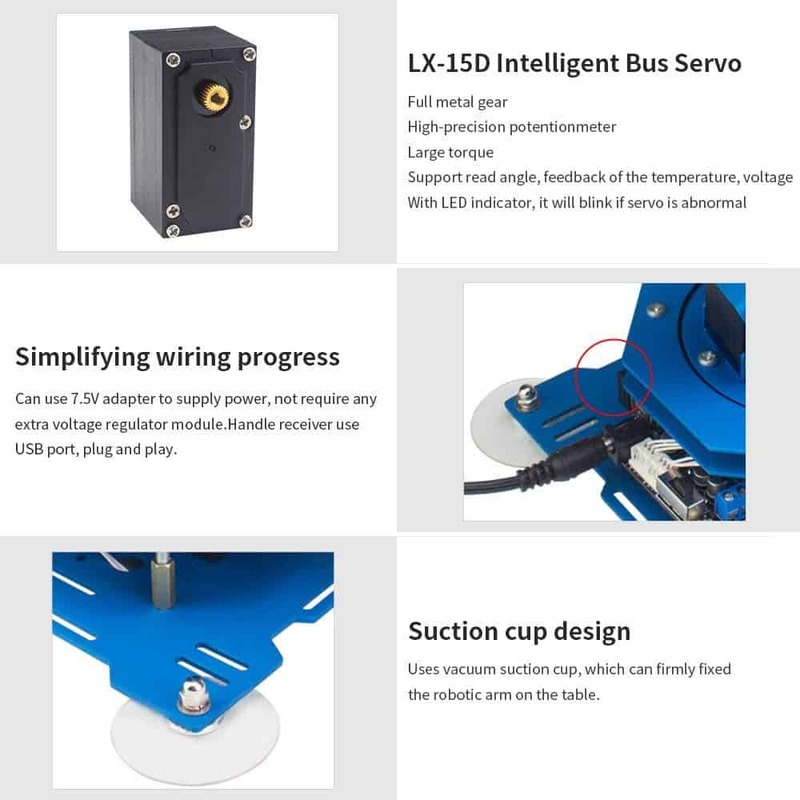 Ensure to check these specifications as they are quite different from one robot arm to another and can be a limiting factor for certain applications. You will find information on the braking system of each robot in its specifications. Some robots come with brakes on all their axes while others don’t. To have a repeatable and precise position when working, you need to have enough number of brakes. The inertia of robot arms can be provided by the manufacturer. You may also find different applicable torques on robot axis. For instance, if your task requires moving a certain amount of torque, you need to check if a robotic arm can accommodate that maximum torque on its axis. Overloading the axis will make the robot shut down or disassemble. LOOK NO FURTHER. We have finally found the best robot arm on there!! 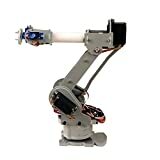 This new arm just came up on Amazon and it’s the cats meow! Now, this is what we’ve been waiting for, a model that is up to date with new technology, has the right price, looks cool, and works well. This thing is all the above and then some. The LewanSoul is perfect for the novice that just wants to have fun, but doesn’t want to pay an arm for it, see what I did there!! And … it goes beyond that, as it’s also perfect for the advanced user that as a real purpose in mind with the arm. The specs on this are amazing, fast, accurate, real torque, controlled by tablet or computer. The arm needs to be put together, it’s a little complicated, but this is how at the same time you learn how to fix it if ever things come up. What I found really impressive with this arm is …. The video tutorials, yes, they a whopping 15 videos made by the makers who show you exactly how to setup, use, program and troubleshoot the arm. Any other arm I’ve reviewed, didn’t have ANY tutorial videos. 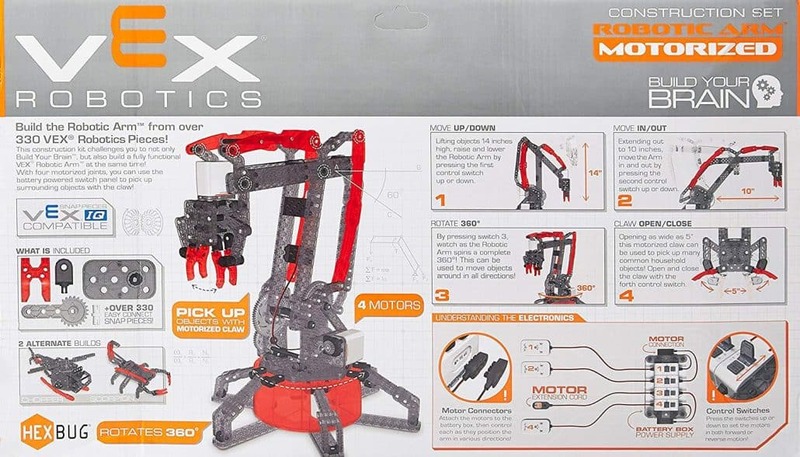 Perfect for the teen who wants to get into robotics! This is now our top picked item, a rare find. 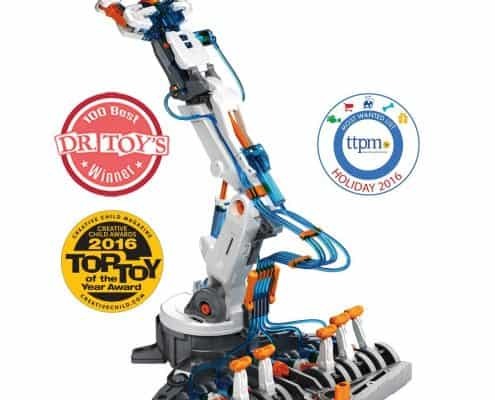 Are you looking for a perfect gift for a child who has shown an interest in robotics? Is your young son or daughter into electronics? Or are you interested in learning robots and want to build your own? Then, OWI Robotic Arm is worth considering. 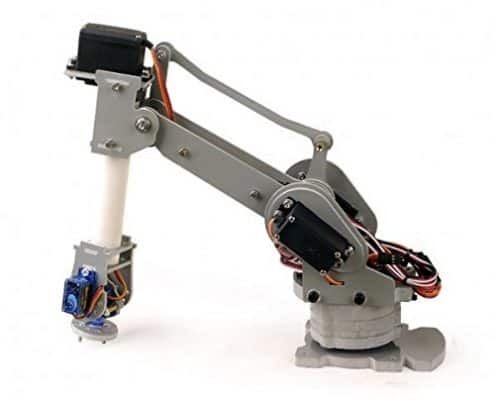 This intermediate robot arm from OWI Robotics is one of the best entry-level robotic arms. 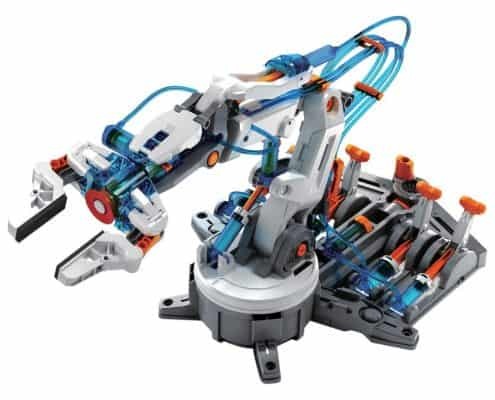 OWI is a reputable brand and is popularly known for making educational robotic kits. This arm can get your child started in basic electronics, robotics, and mechanics. 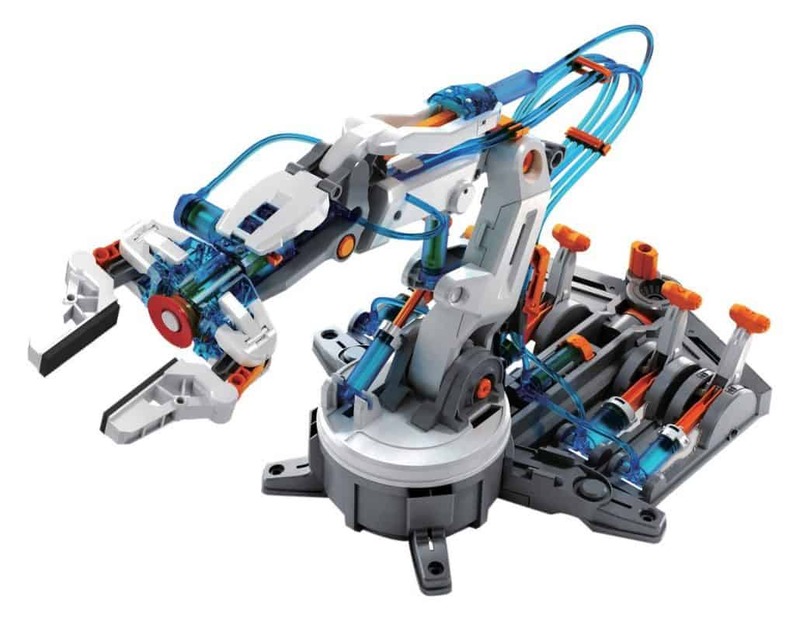 The OWI Robotic Arm is an entry-level buildable robot kit that may give your kid first-hand experience with robots. 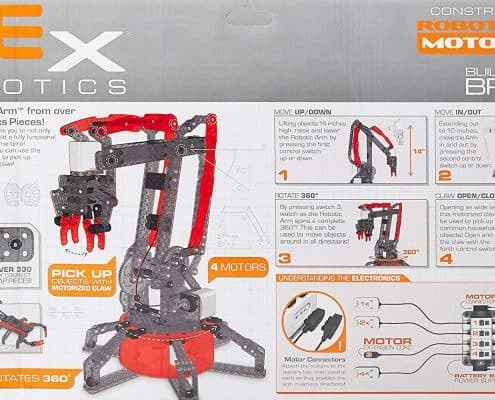 The arm comes with an impressive range of motions and can lift up objects of up to 100grams. It has an LED light allowing you to use it at night and all the gears have audible warnings. This will save you from stripping out or injuring the gears accidentally as you work or play with it. 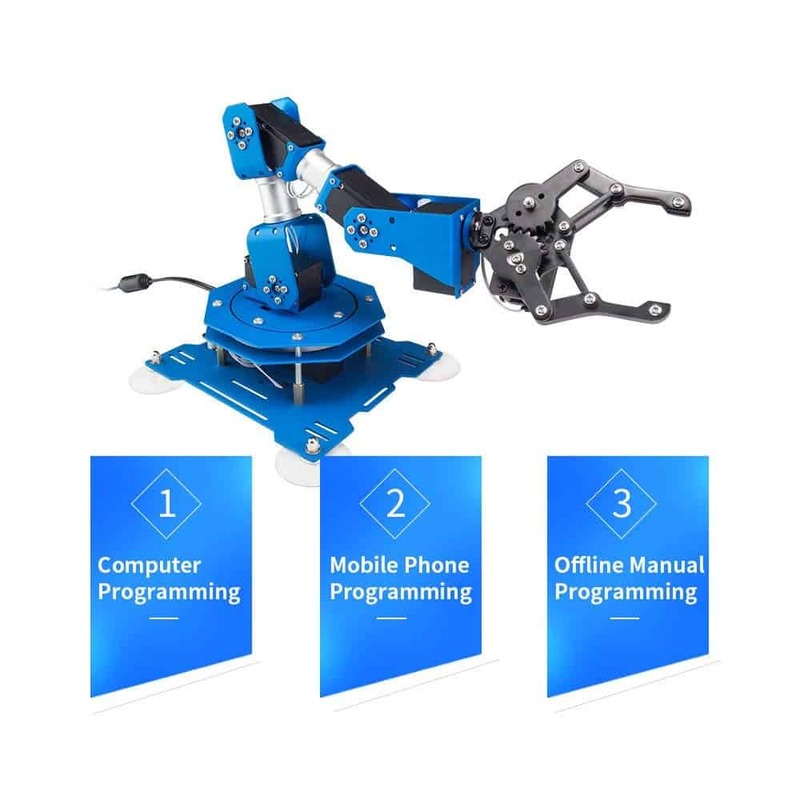 When you order OWI Robotic Arm, you are provided with OWI parts templates for building the outer casings of your robotic arm, motors, gears, a wired controller, screws, and an instruction manual detailing how to build this kit. Don’t worry about constructing this kit as the robot is relatively easy to assemble. It will help you kid develops some skills and background in electronics. The presence of detailed user manual makes it easier for anyone to assemble it; in fact, you will be able to assemble it within a short time. 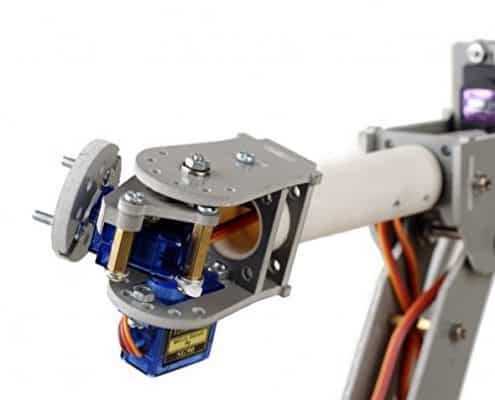 The robot arm gripper opens and closes. It can lift weight items of up to 100 grams; for instance, a big screwdriver or an empty can of soda. You can even expand the capabilities of this arm with a software and USB interface cable, but these are not included in the package. 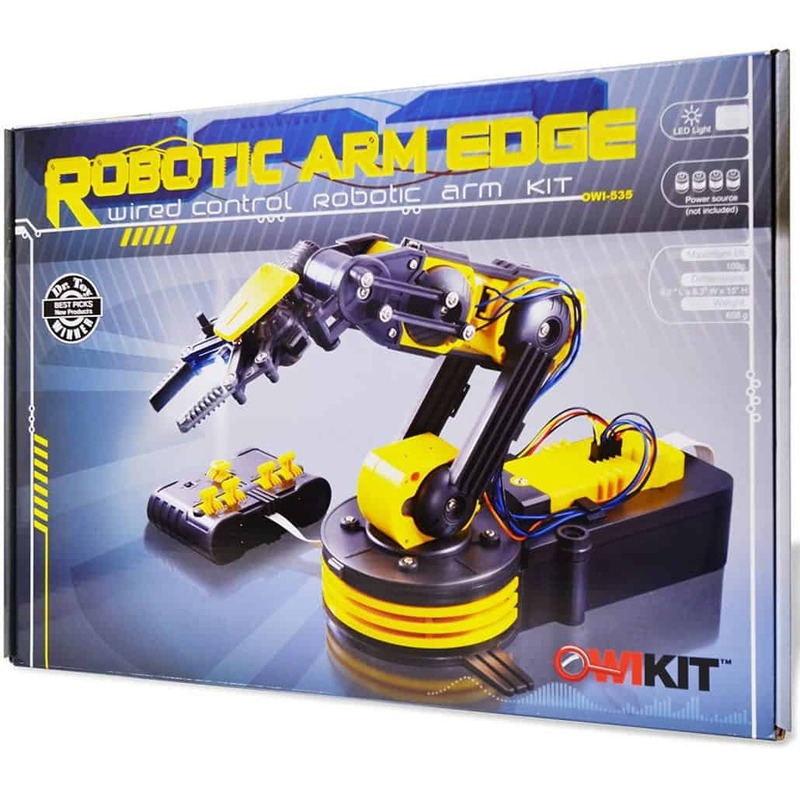 The kit is relatively affordable, and you will have hours of fun with this robot arm. Your child will get started on the basics of robotics; a factor that can make them become programmers and engineers in the future. This robot arm has an excellent range of motions. This means that you can manipulate the arm to perform as per your liking and you will have no trouble lifting items. The arm has no sensors, and therefore you will need to be careful when using it to avoid pushing it beyond its range of motion as doing so will make some parts break. All the gears in OWI Robotic Arm feature audible gear warnings. This safety measure means that they will click if you push them in the wrong direction or too far. The feature prevents gear injury or stripping by warning you that gear is moving improperly or pushed too far. 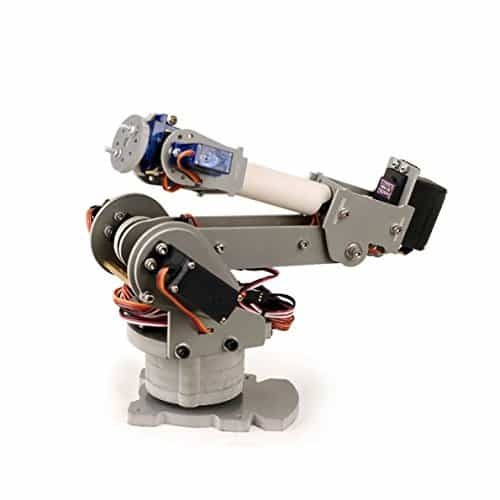 Playing at night is now easier with OWI Robotic Arm as it features LED lighting on the gripper. The LED light allows one to see what you are picking up. It also makes the arm look cool. This arm features a radial wrist nod of 120 degrees, base rotation of 270 degrees, an elbow motion of 300 degrees, a vertical reach of 15 inches, a horizontal reach of 12.6 inches, and a base motion of 180 degrees. Are you into science? Or maybe your kids are interested in learning STEM subject? If so, then Pathfinders Robotic arm is a good start for them. This arm comes with 66 parts and glue, making it very convenient for the uses. It is also safe and easy to assemble since all parts are made of wooden sticks. Besides, its lightweight making it easy for users to display it in the living room since it is child safe and light. 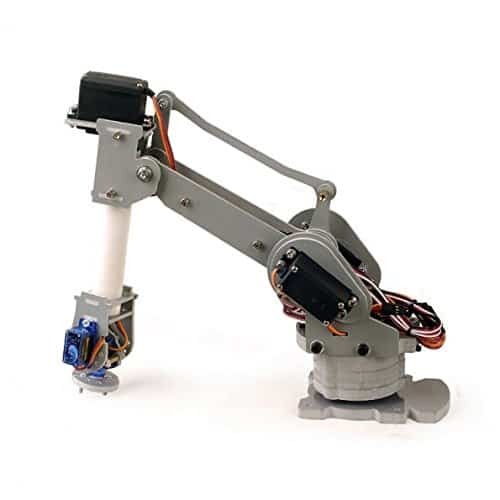 The Pathfinders Robotic arm comes with virtually everything your kids needs to assemble this robotic arm except for food coloring to identify liquids going in syringes, ruler, and a good pair of scissors. The tubing for all the fluids you will use for hydraulics, plywood structure pieces, glue, and syringes are all provided. 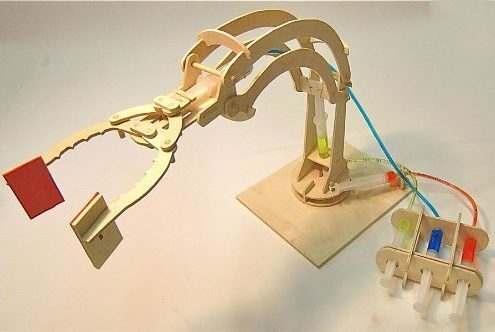 This robotic arm is easy to assemble and can make a 3-dimensional model that picks and lift items horizontally. It can turn close to 90 degrees. This model is designed to be used alone, of course with a nice syringe holder, or in a group with each person using a syringe. It offers a great way to learn about levers and simple machines, robotics, engineering, fluid dynamics, design and technology, and invention. It is a great arm for moving things around the house. The finished arms measure approximately 13-1/2 inches tall and can reach out over 16 inches. It can also rotate to 90 degrees while on 6-7/8 inches by 8-5/8 inches. It is meant to be used for children over the age of eight years and comes with a 12-page user manual. It uses water in place of hydraulic fluid. 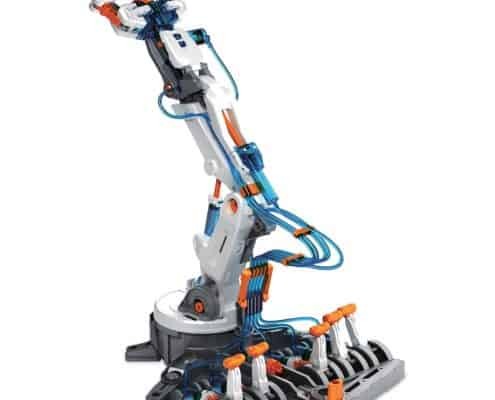 This Pathfinders kit is a fully functioning hydraulic robot arm and thus help you understand fluid dynamics, robotics, simple machines, and levers. It is made using wood from sustainable sources and includes pre-cut pieces and glue for quick and easy assembly of parts. Best Robot Vacuum 2018“The robotic arm can be removed from its base. It takes a short time to assemble all the parts since all pieces come pre-cut. Robot arm technology just got more interesting with this hydraulic arm from OWI. This kit comes with different parts for every passionate young engineer to sharpen their minds and enhance their creativity. The hydraulic arm edge kit from OWI has a variety of movement functions that your son/daughter will find useful. With its large rotation degree and durable grippers, this kit will truly make learning engineering easier. In addition, this robotic arm is well-known for its superior braking system that makes it operate smoothly when undertaking its process. On top of that, this robot arm can work without batteries and electricity. The kids will be amazed by the lifting ability of this robot to grip small items. With OWI Hydraulic Arm Edge Kit, you will have six axes of wide-ranging movements. 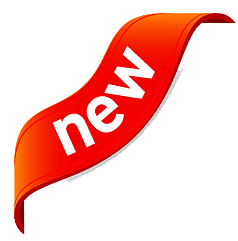 Its gripper can open and close up to 1.9 inches, has a wrist spin of 180 degrees, shove range of 44 degrees, shoulder motion of 45 degrees, and base rotation of 270-degrees. The kit can reach a height of 16.35 inches and has a horizontal reach of 12.42 inches. With a lifting capacity of 50g, this robotic friend can lift small items such as pens and pencils. You can remove its gripper to activate the suction apparatus which enables you elevate objects with larger surface areas such as a small mobile phone. 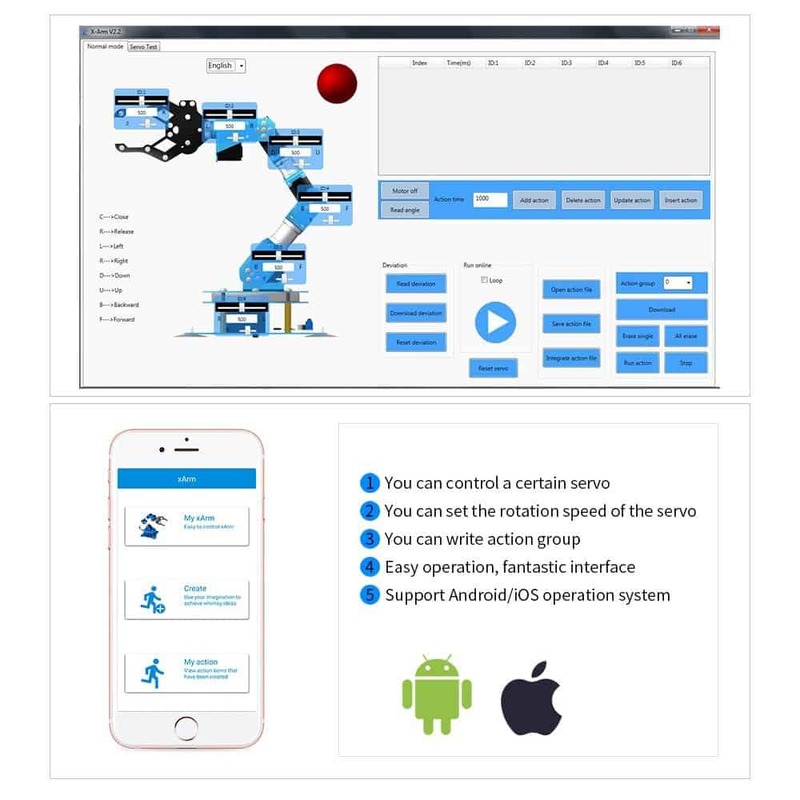 Another exceptional attribution of this robotic arm is its braking system that is integrated into its lever controllers; it enables this arm execute orders accurately. This means your kids will have total manipulation and command using the principles of a hydraulic system and how one can apply it. OWI offers an easy-to-follow user manual with step-by-step instructions as well as graphic illustrations on how to assemble and use this kit. 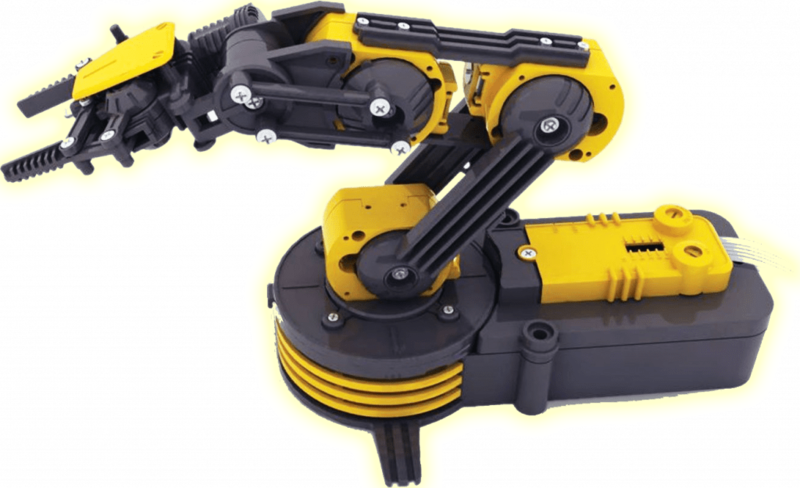 Compliment your Science, Technology, Engineering, and Math (STEM) learning strategy with this hydraulic robotic arm. 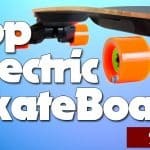 It does not use any battery or motors as it’s powered by water. Water is used in place of hydraulic fluid, and thus you can easily manipulate axes movement through lever controllers. This hydraulic robotic arm enables one to use it outside since it doesn’t require batteries or electricity to run. It allows one to discover hydro-mechanical technology and have fun at the same time. 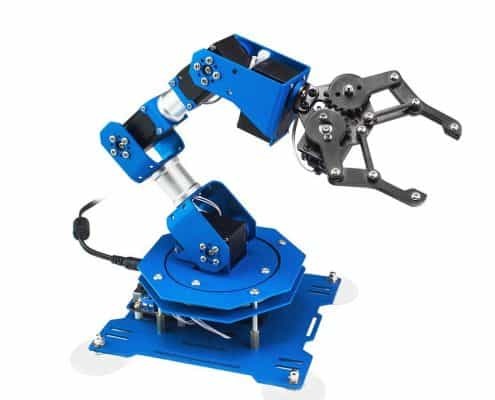 This robotic arm has six axes of movement, wrist rotation of 180 degrees, elbow range of 44 degrees, among other notable motions. Comes with detailed graphic illustrations that allow you build the kit successfully. Although made in Taiwan, OWI product include assembly instruction only written in English. You can remove the gripper to activate the suction apparatus; this enables you to lift and “vacuum” objects. VEX Robotics is one of the leading providers of competitive and education robotic products to learning institutions and robotics teams around the world. It has made scalable, accessible, and affordable robotic solutions for many years. HEXBUG is a product line and brand designed to give kids a positive experience with robotics in their early years. People are drawn to this robotic arm because of its fascinating behavior, eye-catching packaging, and intelligent bug-like attributes. 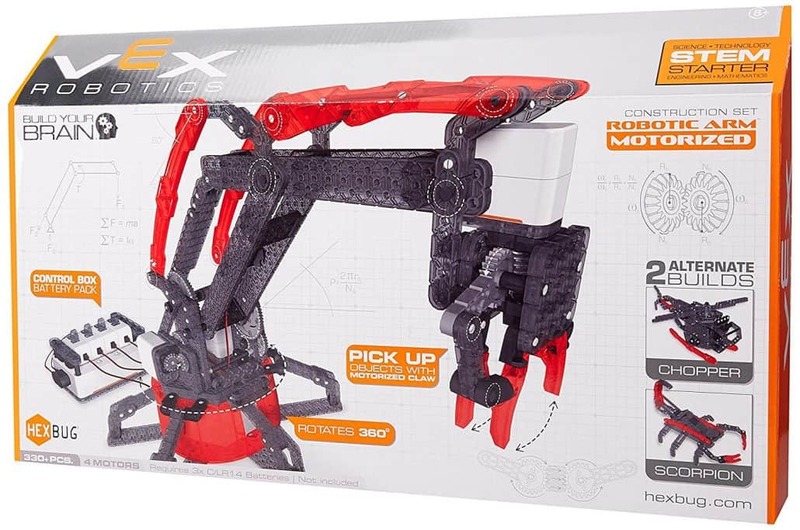 First up, HEXBUG VEX Motorized Robotic Arm is not a robot for playing with- it is a construction kit. 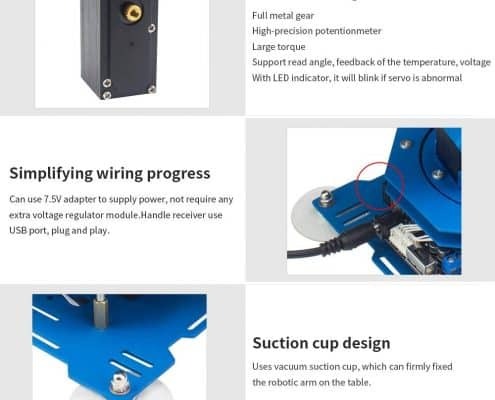 Featuring more than 350 parts, some of which are tiny plastic pegs and pins, and other large plastic plates, this kit will introduce you to the field of robotics in a broad manner. By following the included instructions, you can build this arm from scratch, pinning together all the parts. It can take a couple of hours to complete assembling it, with main gears and base section being the most challenging parts to pin together. To be honest, building this kit is quite challenging as most parts are black and following written instructions can sometimes confusing. You need to follow all the instructions carefully for you to have a fully-functional kit. The claw and upper arm are more enjoyable to assemble with bigger bits and fewer fiddly little pieces. Once completed, this robotic arm stands 18 inches tall and looks very attractive. While this window cleaning robot cleans large windows, it does not clean windows that are smaller than 24 inches tall and 18 inches wide. This is because its sensors allow it to map at least that far before it stops working. 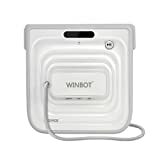 It has automatic sensors that allow it to detect window edges and edgeless windows so that it cleans to the end of your window and no further. You can control using a remote control and steer it as needed. Its battery can last for about 15 minutes making it possible to clean up to six large-sized windows. When it finishes, this robot window cleaner plays a tune to notify you. You can turn its suction off by flipping its switch so that you can remove it from the window. Because this robot returns to the area, it originally started, and therefore you can use it on tall windows that are difficult to reach as it will return to a place where you can access it. Quiet operation- this device operates quietly; you can barely hear it cleaning a window surface on the outside if you are inside the house. There has been many reports on it actually breaking panes of glass. 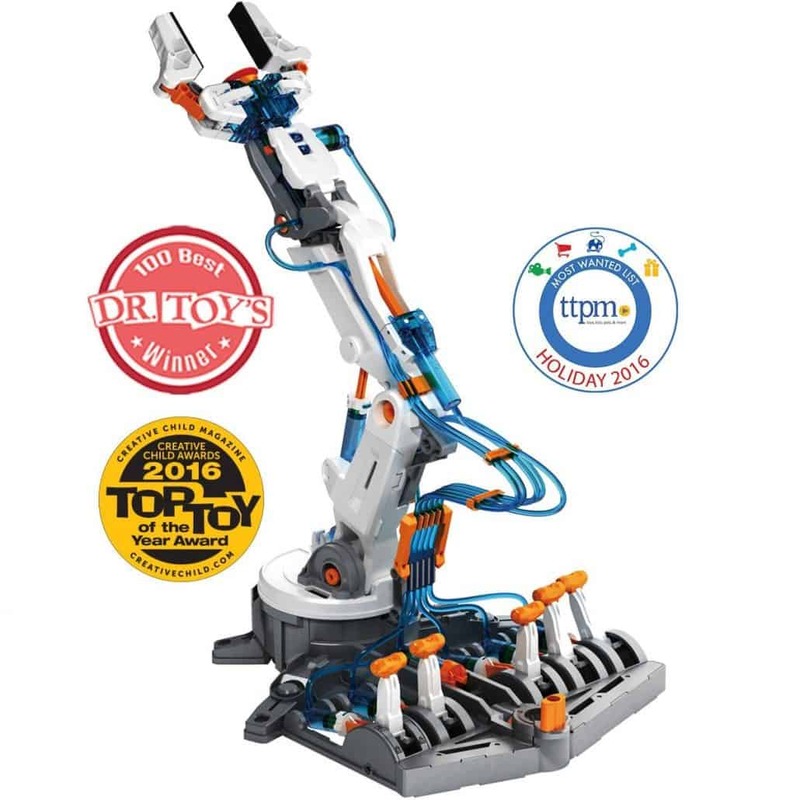 A robot arm has become a trendy toy nowadays. Most of the parents are purchasing them to their kids who show an interest in science and engineering. It helps kids familiarize with recent technological advancement and at the same time boost their interest in technology. 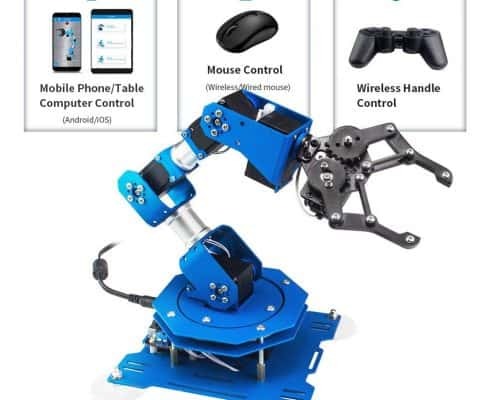 This desktop robotic arm from SainSmart will offer both you and your kid basic knowledge of robotics. This product is made from durable material and can rouse the actual palletizing structure of a robot arm. The model is very high-tech since it moderates with the CNC or Computer Numeral Control that involves use of computer to control. 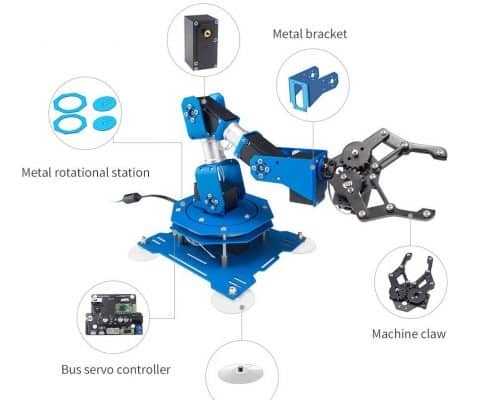 Once you purchase SainSmart 6-Axis Robotic Arm, you will get a package with 4 MG996R servo, structural frame bearings, two SG90 servo, and all necessary screws.